For The Record: Never Say Good-Bye? A proposal to create a 10-year nationwide records retention policy has produced differing opinions on the merits of such a plan. Should healthcare organizations hold on to what they’ve got? The retention and preservation of paper- and film-based medical records isn’t the sexiest topic, especially as so much emphasis across the healthcare industry is currently being placed on selecting and implementing EHR systems. However, the fate of decades’ worth of records on paper and film is receiving increased scrutiny precisely because the healthcare delivery system has reached a critical transition point between storing patient information on paper and in digital formats. It should probably come as no surprise that some experts in the field are calling for a federal policy that will give providers and patients a consistent nationwide guideline for the length of time these old records must be retained. Such a nationwide policy, they say, would eliminate the confusing patchwork of laws and guidelines that differ between states, specialties, and agencies overseeing the licensing and certification of provider organizations. However, other experts believe that, as we enter the dawn of the age of genomic medicine, records should be saved for at least the life of current patients and perhaps saved for their descendants, who might benefit from knowing whether markers or susceptibility for a certain disease potentially run in the family. Additionally, they say, the advent of PHRs will mandate that providers would benefit by erring on the side of having more records available, should patients begin compiling their own medical dossier and express a need for them. Ed Santangelo, senior vice president of healthcare at Boston-based Iron Mountain Inc, has proposed a 10-year nationwide records retention policy as part of the shift to EHRs. One of the oft-spoken benefits of a wholesale move to EHRs is a projected savings resulting from the instant and concurrent availability of digital records instead of relying on redundant copies of paper records spread throughout organizations. However, exactly how much money could be saved from the shift has remained an elusive target—particularly in the first year of implementation, when experts estimate a typical physician’s office may take a 30% reduction in productivity while staff learn the new system. Developing and adhering to the standard, Santangelo wrote, will require a strategic plan for the transition to digital records. Mary Lahey, vice president of account management for Iron Mountain’s healthcare group, says the idea behind Santangelo’s essay was to draw attention to the hodgepodge of state laws and replace them with policy adhering to existing best-practice guidelines recommended by the AHIMA. Lahey says the wide disparity between states’ records retention laws and what information is required to be in those records will actually inhibit the creation of an interoperable health information network. Lahey says implementing the national standard will achieve greater importance as patients become more savvy about their role in maintaining their records. However, Margret Amatayakul, RHIA, CHPS, CPHIT, CPEHR, founder of Schaumburg, Ill.-based consultancy Margret\A Consulting, says she is not sure a blanket federal retention policy would either streamline HIM procedures or improve patient care. Amatayakul also says patients may come to expect that any provider with whom they have a clinical relationship will keep their records as long as clinicians keeping them well past mandated storage periods. Milton Corn, MD, deputy director of the National Library of Medicine in Bethesda, Md., says the medical community should think more about reasons other than statute of limitations requirements for long-term preservation of paper, film, and digital records. “I think the expectation most people have—that somebody is keeping track of their health records while they live—is reasonable, and I would think 10 years is much too short,” he says. In an essay titled “Archiving the Phenome: Clinical Records Deserve Long-Term Preservation,” published in the January-February issue of the Journal of the American Medical Informatics Association, Corn argued that expected patient care advances in the coming decades, coupled with more patient involvement in maintaining their own records, will actually encourage providers to archive old records for a century or more. This strategy, he says, will likely happen at regional teaching hospitals with renowned reputations. Archiving such a long record, he says, will be motivated by patient care rather than the various states’ statute of limitations for legal action that are now predominant in retention regulations. For example, Corn remembers calling for an old chart while working at Brigham and Women’s Hospital in Boston. In that chart, he found a note from neurosurgical pioneer Harvey Cushing, MD. “That’s like having a note from Hippocrates,” Corn says. 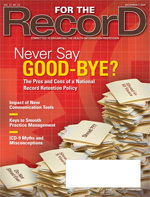 John King, chief operating officer of EvriChart, a records management company, says that rather than sign on to a nationwide crusade to bring every provider organization in line with a blanket federal policy, HIM managers should begin planning for a hybrid record-keeping and retention system that can meet both state retention statutes and the privacy and security provisions of the HITECH section of the American Recovery and Reinvestment Act (ARRA) for at least the next five to 10 years. For example, King says, up to 60% of emergency department patients will re-present some time within the next 12 months and, rather than call up a paper-based record, either in-house or through a records storage vendor, “it’s better to call that last visit up within seconds for continuity of care, billing and auditing purposes, or whatever that reason may be. Developing a close collaboration between HIM and HIT departments will need to be an inherent part of devising a new hybrid retention strategy. Ironically enough, says Harry Rhodes, MBA, RHIA, CHPS, director of practice leadership at the AHIMA, older records are often quite succinct, while paper printouts created from digital systems often create reams of information that prove far more unwieldy to store. Perhaps the most important person in determining what’s part of a vital medical record, and how long those records should be kept, is not an HIM or HIT expert but the person with the most to lose should those records be destroyed: the patient. Rhodes, Lahey, and Amatayakul are among those who keep copies of their records, and Rhodes says he can envision a scenario whereby patients are offered institutional encouragement to do likewise. Amatayakul says healthcare providers must keep the patients’ expectations in mind when considering what to do with records.